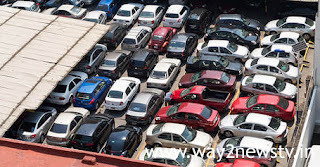 Home / telangananews / PARKING DIFFICULTIES WHEN ARE YOU GOING? PARKING DIFFICULTIES WHEN ARE YOU GOING? The Karimnagar district is the most famous city in North Telangana and then the city of Srinivasan has been awarded with the status of liberty but neglected to provide minimum facilities. Parking spaces have been exhausted to keep the vehicles running on roads. No other vehicle or vehicle drives have been placed on highways.The population is growing daily at Karimnagar district center. The number of people coming to the city has grown significantly because of the recognition of a smart city, a special center for education and medical care. They are coming for employment, job opportunities and settling permanent residence. Officials estimate that lakhs of people per day for various tasks in the city will be expected. That is, the number of people on the vehicle is heavy. Parking spaces are essential to all of these. Parking for vehicles moving around thousands has become a problem. There are no parking spaces and no parking space by the corporation within the city limits, and the vehicles are on the streets of the city. In December 2016, the old municipal guesthouse was declared a payment parking place. City Mayor Ravinder Singh has taken steps to clean up the site and examine the practice of the parking lot. Examined how many vehicles are experimentally experimented with the authorities. This observation was taken away for nine months. The store complex was built on the upper municipal guest house located in the heart of the city. The ground floor was left for parking for vehicles coming to these shops. Here the corporation has been forced to set up a paid parking lot. Now it is auctioned for renting and it has been postponed as prices are unacceptable. When it comes to recharging the bidders, all the shops will have to be handed over to the same company. This means it does not mean that the paid parking will be set up. Thousands of thousands of people who live in the township and to the main vegetable market are traded and traded. They ride bicycles, autos, and cars. However, there are no parking spaces for vehicles coming here. The traffic issue has become intense as the vehicles are on the roads. During the festive season, the fires are on the way to travel on vehicles. There are no parking spaces on either side of the main road, which is 14.5 km long within the roads and buildings. Vehicles are parked on the roads at hospitals, hotels, banks and shops. At least hundreds of vehicles do not mind at least as long as the vehicles are retained. The major roads in the city are large shops, banks, hospitals, and the cellar parking is mandatory for all of them. But nowhere is the cellar parking running. And the consumer vehicles are not allowed except to retain their own vehicles. Hence the vehicle drivers are struggling to keep the vehicles on the other or on the road. Having hundreds of vehicles in front of the Commercial Complex, at least the cellars are not open. In some areas shops were also set up. If you open all of these, the vehicles will be reduced on the roads. Even so many urban planners have not been neglected in implementing the Sri Lankans for relevant trade firms. If you open all of these, parking on roads will be reduced.